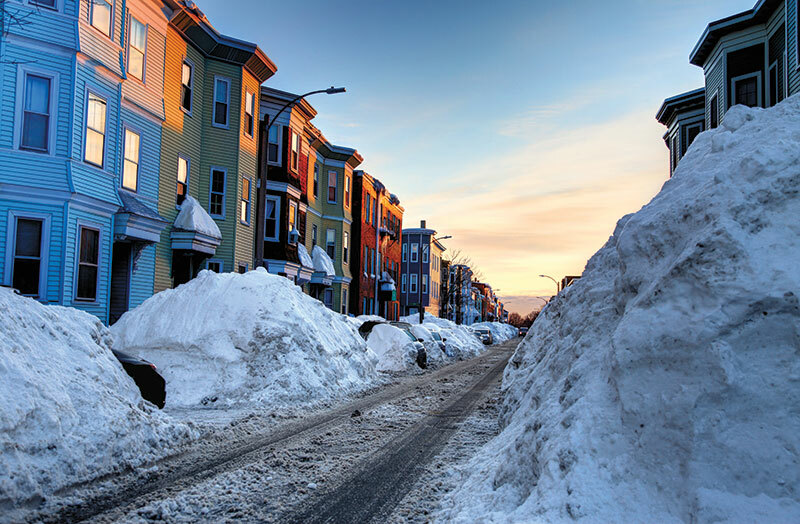 From Florida to Maine and across the country to California, this year’s heating season brought some rather calamitous climatic events amid varying levels of load, bottlenecks and short fills along with an assortment of other operational challenges and successes. January was a different story, though, as the new year got off to a chilly start, especially in New England. Several shiploads of propane were brought in off the high seas; two of the vessels, though, were delayed in tying up at the terminals with much-needed January gallons. Alexander notes that due to the mild February propane suppliers carried February supply into March, when nor’easters in New England assisted in reducing excess purchases. Even if New England’s March load turns out to be lower than desired after a less-than-favorable February, a triad of nor’easters certainly captured the public’s attention. Large expanses up and down the Atlantic coast and points inland experienced one-two-three punches of fierce bomb cyclones with hurricane-force winds, surging tides, flooded neighborhoods and snow accumulations topping 2 ft. in some locations. On March 2, Buffalo, New York, was buffeted with its deepest 24-hour snowfall total since 1914. In York, Maine, the storm uncovered a shipwreck possibly dating back to 1750. Propane availability was a valued commodity as electrical service ceased for millions of people. Many were homebound with roadways rendered impassable and businesses shuttered. Crucial commuter trains sat at depots, stopped by disabled signals, iced switches and toppled trees blocking the tracks. 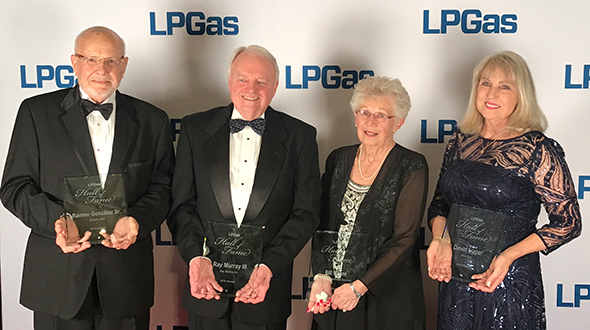 During the lead-in to the heating season and as the cold swept in, industry leaders at the National Propane Gas Association (NPGA) and the Propane Gas Association of New England (PGANE) proactively prevailed upon railroad officials to make moving LP gas a priority. Leslie Anderson, president and CEO of PGANE, was among those taking the lead in tracking tank car movement and keeping membership apprised of the situation during January’s plunge into deep-freeze conditions. NPGA also communicated with the Federal Motor Carrier Safety Administration (FMCSA) and other authorities about the importance of granting regional rather than state-based hours-of-service waivers for transport drivers. 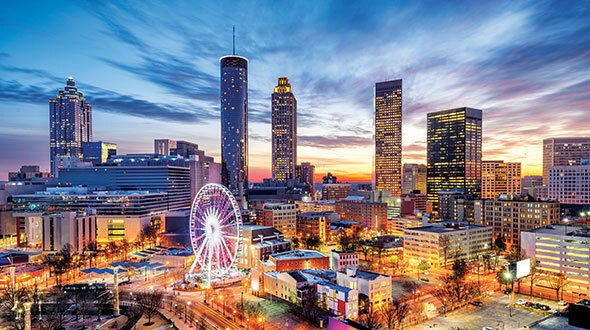 The resulting regional hours-of-service policy subsequently brought relief to marketers in 37 states, and NPGA was also able to present pipeline-performance concerns to relevant officials. According to Botts, logistical anxiety was somewhat eased because the supply managers at the terminals communicated and issued schedules. As the heating season progressed, the industry got into a groove and things turned out better once everyone figured out the game plan, he says. A shortage of transports remains a concern. According to Botts, many people are frustrated about not having enough truck drivers or trucks. It’s likely this heating season’s overall pre-winter buying patterns were at least partially influenced by last year’s lower usage rates. From a national perspective, propane demand during the summer was below the five-year average, according to Warren Wilczewski, industry economist at the U.S. Energy Information Administration. He adds that on-site storage makes a difference for efficiently meeting yearly load levels. Thus, in October through mid-November, there was demand from retailers filling up their tanks, Wilczewski says, and there were unexpected calls for grain drying, which should have been anticipated by marketers serving the agricultural sector. 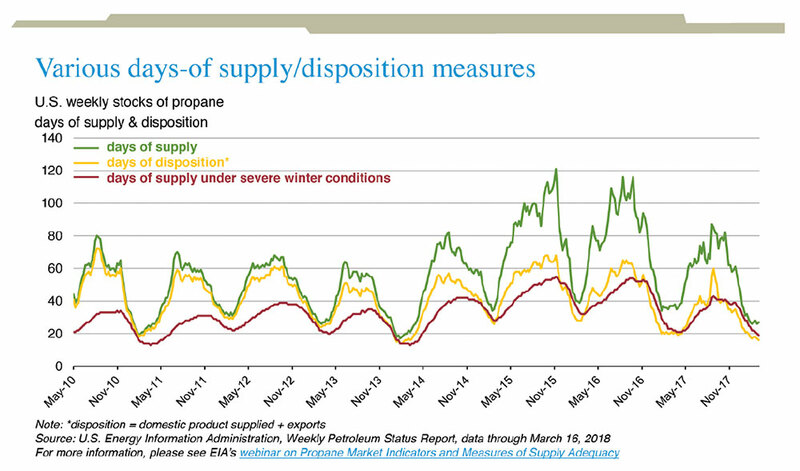 Wilczewski reports there’s still plenty of propane left in America’s stocks, referencing the lingering remnants of winter’s last gasp as spring approached, though he notes this could be different when broken down by region. Temperatures between Christmas and New Year’s Day averaged 60 percent colder than 2016’s holiday-week readings, trending onward into January. 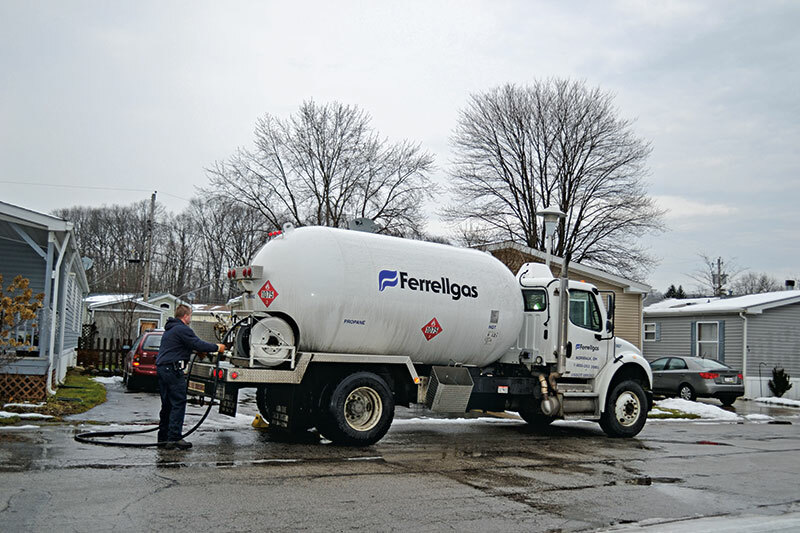 Referring to a positive momentum in customer-demand trends, revenues in the fiscal first quarter of 2018 were comparatively up 17.6 percent for Suburban Propane, primarily attributed to higher volumes and prices. Florida and the Mid-Atlantic were hit with unusually harsh conditions this year. According to Tom Osina, executive director of the West Virginia Propane Gas Association, West Virginia had a cold winter and propane retailers were kept busy. Osina is awaiting the season’s gallons-burned tally, pending a membership meeting once the snow has cleared. “The bottom line is that December was solid and January was one of the best months we’ve had from a volume standpoint,” says David Bertelsen, the national propane product manager at Matheson. 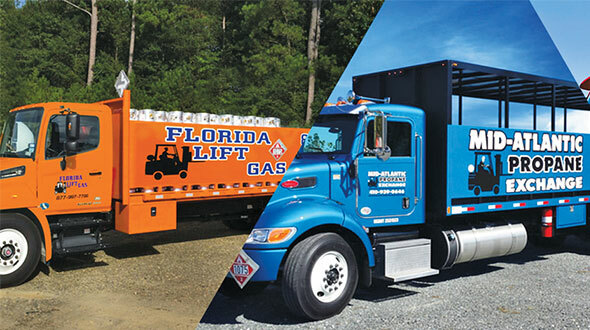 Bertelsen is also West Virginia’s state director for the NPGA, as well as chairman of the Ohio Propane Gas Association’s (OPGA) Membership Services Committee. Bertelsen notes that January was a bit hectic for certain members of the Ohio association, but customers were not aware of the shortage, nor did they run out of product, despite some retailers securing spot loads to get through a couple of tight weeks. There were some challenges with getting supply from point A to point B, Bertelsen says, but he acknowledges that hours-of-service waivers granted by FMCSA helped when supply got tight. The OPGA was anticipating higher-than-normal volume totals. According to Derek Dalling, its executive director, several members of the association reported their highest use in a decade in December and January. Addressing potential supply disruptions is a key issue heading into next year. According to Dalling, OPGA continues to stress that members need to make investments to increase on-site storage, as well as make arrangements with their transport companies to ensure they are a priority, the transporter is compliant with ELDs and that they have plenty of drivers. Dalling also serves as executive director of the Michigan Propane Gas Association (MPGA). Michigan did not experience the same supply concerns as its neighbor to the south, though, according to Dalling, wait times increased during the holidays and the hours-of-service waivers kicked in just in time. MPGA has been closely watching the situation surrounding Line 5, the pipeline that runs under the Straits of Mackinac and supplies Michigan with 50 percent of its propane. According to Dalling, if the pipeline had been shut down this winter, the supply situation for the entire industry could have gone into crisis mode. Citing the state’s 250,000 residents who rely on propane as their primary heating fuel, Wisconsin Gov. Scott Walker proclaimed an energy emergency, which was accompanied by hours-of-service exemptions. Per-gallon sales were up 19 percent over 2016-17 at Premier Cooperative in Mt. Horeb, Wisconsin. According to energy division manager Tim Lease, rail and pipeline terminals were having trouble keeping up with demand for about three weeks. Noll notes that, while Kansas has not experienced heavy snowfall this year, it has been much colder than the previous two years, which translates into dollars for the industry. Much like Kansas, Nebraska experienced a colder winter than the last couple of years, according to Lynne Schuller, executive director of the Nebraska Propane Gas Association. 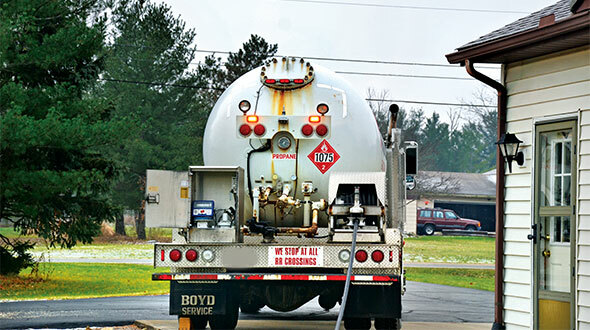 Several propane providers resorted to short fills. However, the customers were getting what they needed on time to keep their furnaces fired up, she adds. According to Dan Binning, executive director of the Colorado Propane Gas Association and the New Mexico Propane Gas Association, Colorado and New Mexico had a warm and dry heating season. Volumes were 10 percent to 15 percent below normal. There were no issues with deliveries, and hours-of-service waivers were never considered, Binning adds. Transport assistance was rendered to Florida, Indiana and Ohio, according to Clark. Larry Brooke of Arroyo Energy in Kingston, Washington, notes that, despite having the second-warmest January on record in the Pacific Northwest, in November and December his company reached record volumes. February and March also turned out to be good months, as arctic air descended on the region. By January, the Canadian rails were humming with southbound tankers in time to service the accounts. 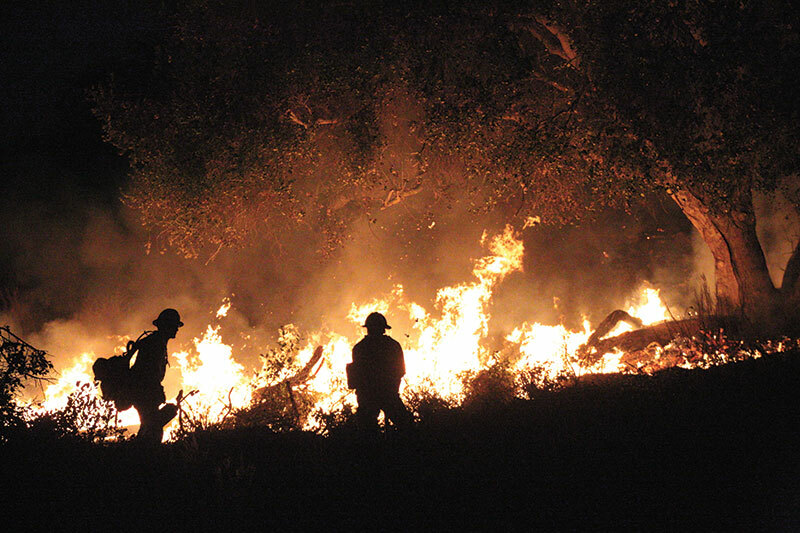 Wildfires, rain and subsequent mudslides created difficulties in California. “It’s happening more frequently than we’d like to see. A lot of times the metro areas are spared, but this time around it didn’t happen that way,” says Joy Alafia, president of the Western Propane Gas Association (WPGA). Areas around Los Angeles, as well as Santa Rosa, California, suffered extensive damage due to natural disasters, which also affected propane marketers in these regions. Joined by industry volunteers, the WPGA coordinated with the Federal Emergency Management Agency and the Environmental Protection Agency to retrieve scorched tanks that had been swept away.